Italian philanthropist; born at Asti Nov. 3, 1829; died at Pisa Feb. 20, 1904. In 1889 he rebuilt the Jewish synagogue at Asti, and two years later organized the exposition held there, of which he was president. In 1898 he promoted a second exposition. King Humbert I. visited both expositions, and on March 14, 1899, conferred upon Ottolenghi the hereditary title of count. In 1903 Ottolenghi presented a statue of Humbert I. to Asti, and founded an Alfieri collection in the Palazzo Alfieri. 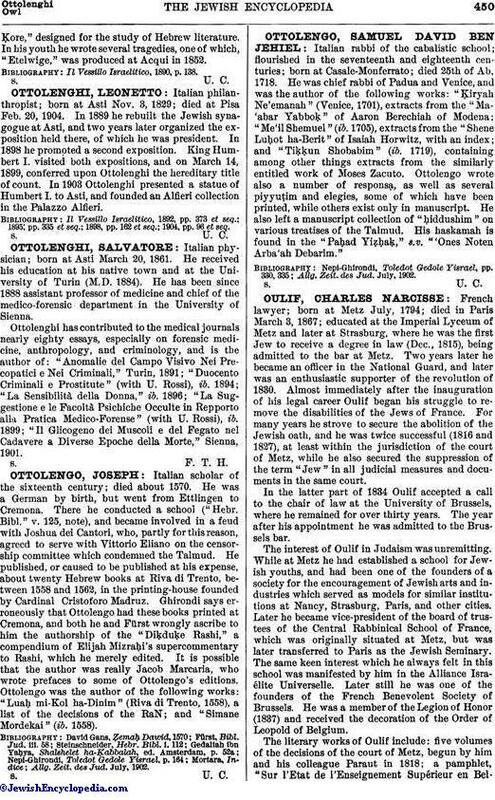 Il Vessillo Israelitico, 1892, pp. 373 et seq. ; 1895, pp. 335 et seq. ; 1898, pp. 162 et seq. ; 1904, pp. 96 et seq.